The Constitution requires a natural born citizen, Art 2 Sect 1. And this 'whatever' says clearly his father was a Kenyan. What gives? The Constitution was all about stopping a person with dual allegiance from becoming president. Burke, does one go mad after jumping the shark or jump the shark after going mad? Mad is Obama refusing to release all of his birth certification, even in court challenges, one of which resulted in a US military officer being incarcerated. Mad is how the American public feels over the fact such a cut and dry issue could drag on so long b/c we have a President who'd rather play cat-and-mouse games instead of respecting America's questions, unlike his opposing candidate who faced a similar challenge. Inconsistencies with the Nordyke CLB. 1. Box 7c naming convention is not the same. One says Honolulu, Hawaii, the other says Honolulu, Oahu. 2. The actual certificate number on the Nordyke form is "61 10637", the twins were born on the 5th (accepted by the registrar on the 11th. 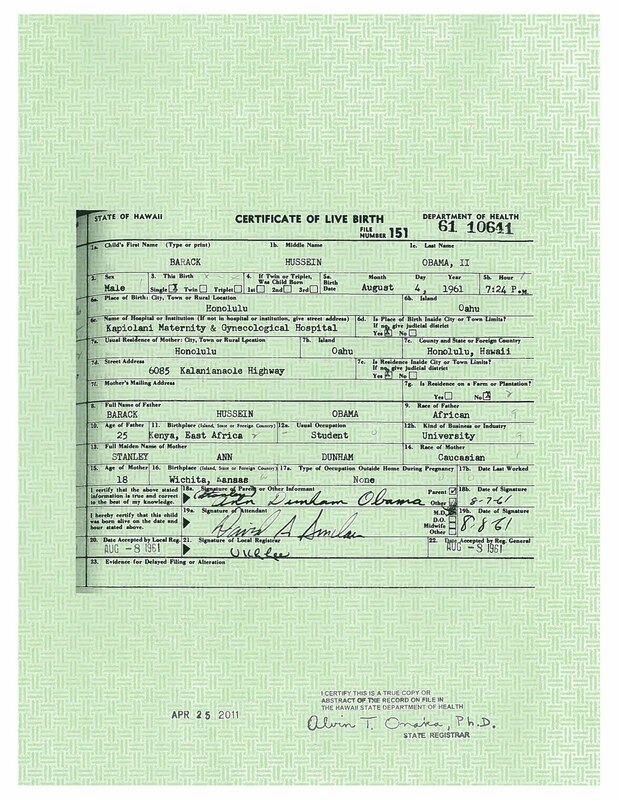 Obama certificate number is "61 10641" and he was born on the 4th (accepted by the registrar on the 8th). The name of the hospital at the time of his birth should have been Kauikeolani Children’s Hospital. According to the web site the name didn’t change to Kapiolani Maternity & Gynecological Hospital until Kauikeolani Children’s Hospital merged with Kapi‘olani Maternity Home in 1978. 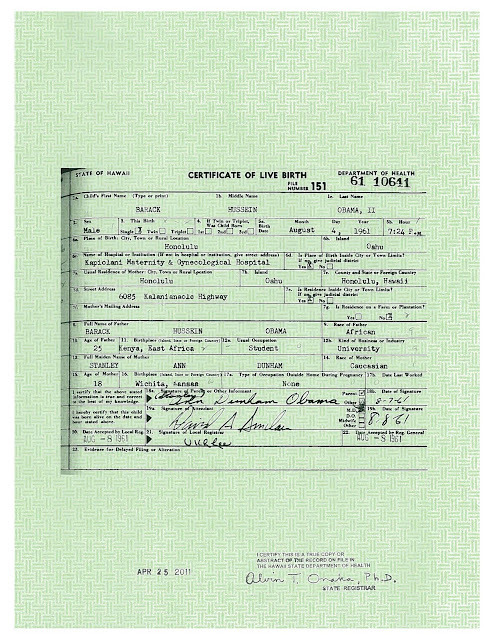 So how could his official long form birth certificate that was generated in 1961 have the name of the hospital that wasn’t created until 1978? What a fraud. "The document goes a long way, if not completely, towards quieting the issue. But the ease with which Obama was able to get the document leads one to wonder why he resisted so long." Uh when your opponents insist on acting like idiots why would you stop them? You give them lots of time to get as worked up as possible, and hence as ridiculous as possible, and then you spring the evidence on them that drives home the point that these people are not serious and should not be taken seriously. And the best part? Because the opponents in this case are conspiracy theorists they make up all new elaborate stories for why the proof isn't really proof which only furthers the idea that they are divorced from reality. Obama just seriously rickrolled the birthers. Oh and he helped give trump a boost at the same time. All in all a very god day for Obama. If by Rickrolled, you mean he put out a fraudulent birth certificate as a joke of some kind, then maybe. See the comments Tialoc. He is a fraud, and this release took about 8 hours for a HUGE GLARING problem with it to crop up. Put the Birth document released by the White house today (the pdf released directly from the White House)into Adobe Illustrator… 22 edits were made. A clean scan should have zero !!!!! ..What a bunch of amateurs. Never hold up in Court as unedited…And where is the official seal??? And don't forget about Jus sanguinis and Natural Born Citizenship, incarcerated Dr. Terry Lakin and the curious CT. social security number. UKLLee? For real? That's who attended his birth?